ABS FC has lost several important players but should still be able to cause a few problems for the bigger clubs in the league. As far as I can tell, ABS FC has registered four goalkeepers: James Aiyeyemi, Suleiman Dogo, Ibrahim Wasiu and David Welbe, a new signing from second level club Abia Warriors FC. One of these players will have to fill the shoes of last season’s first choice goalkeeper Suraj Ayeleso (born 12.03.1991). Ayeleso travelled across the city and joined Ilorin’s top side Kwara United FC. Wasiu was training with the Nigeria U-23 national football team last year and the former member of the Kwara Football Academy is my pick as first choice for the Nigeria Premier League 2012. James Aiyeyemi made several good matches last season and Welbe was apparently captain of Abia Warriors FC, suggesting that he is a quality goalkeeper. In defence, I expect Abubakar Yusuf (born 31.05.1991) to shine at left-back. Team captain Fade Adebayo will most likely lead the central defence together with strongman Henry Ubom. Chinedu Ajanah (born 23.10.1992), another product of the Kwara Football Academy, should also get a lot of playing time. New signing Thomas Zenke is most likely the former defender of the Nigeria U-17 national football team. It is possible that Adebayo, the set-piece expert, will play in the defensive midfield role. Attacking midfielder / winger Abdulkadir Aminu (born 17.04.1991) will provide the creative spark. I expect ABS FC to use several inexperienced players in midfield, including youngster Mustapha Bashir, an attacking player, Kingsley Ovono, a new signing from Abia Warriors FC, Adua Oniyangi and Evbuomwan Stone, signed from the Kwara Football Academy. Daniel Felix is a new right-winger from FC Abuja, apparently born 12.12.1994. Abdulrahman Bashir, the star striker of ABS FC, is still with the team after being linked to Egyptian top club Al-Ahly in November / December 2011. Bashir will be fundamental to the success of the club. Akeem Audu should be able to support Bashir up-front. Andrew Abalogu, a new striker from Abia Warriors FC, seems like an interesting player as he trained with the Nigeria U-20 national football team during 2011. The picture is of Abalogu and is taken from http://www.abiawarriorsfc.com. Ter’ade Ichull Lordson and Ibrahim Abdullahi Bolaji are two new players from the Kwara Football Academy. I am not sure about their position on the field. Apparently, ABS FC has signed Mohammed Tasiu, a striker who played for Ajax Cape Town FC in South Africa during 2008-2009. I believe Tasiu is born in 1986 or 1987. 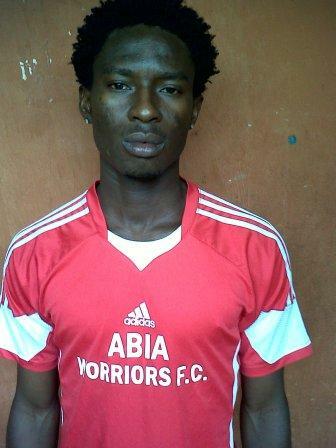 Christian Ofili, the attacking midfielder who starred for Dolphins FC in 2009-2010, is another new signing. ABS FC has also bought several other new players that I so far am not able to identify. Football is another way of uniting african youth. I encourage u to join efforts to build africa especially NIGERIA thru FB. I hail oo! How can they not no my playing position? Am a defensive midfielder.